The earliest known cricket photograph was taken in 1857, by Roger Fenton at the Artillery Ground, when the Royal Artillery played Hunsdonbury. Each man that's in the side that's in, goes out, and when he's out he comes in and the next man goes in until he's out. When they are all out, the side that's out comes in and the side that's been in goes out and tries to get those coming in out. When both sides have been in and out including the not outs, that's the end of the game'. One of the constants of the British Empire was cricket. 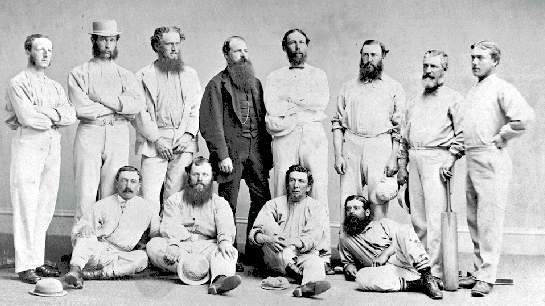 Whether it was crews of the Royal Navy or squads of the British Army, cricket was spread about the Globe by these avid sportsmen. The Columbia Detachment was no different. 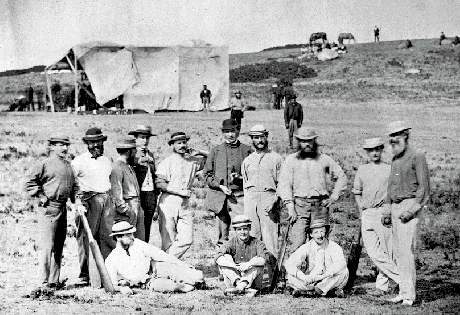 The British Colonist noted that in May 1859, only one month after the main body of troops arrived at the Camp, that the men had already cleared the land and were playing, using the local chain-gang to smooth out the pitch. The RE team played against the Local Cricket teams, the Royal Marine Light Infantry team and the teams off of the vessels of the Royal Navy which visited New Westminster. Unlike the Cricket Clubs in England, the Regimental and Ship teams were mixed - Officers and Men played on the same team. This 1870 photo is of a match being played on the Engineers' grounds at Sapperton between townsfolk (some ex-RE, perhaps?) and the crew of a visiting ship. Note the fellow who is probably a Royal Marine in his glengarry amongst the sailors! Also, note the cedar arbour doing duty as a pavilion. The RE Cricket ground was west of the RE Camp and east of Queen's Park, in the vicinity of the present Woodlands hospital. The Bee referred to in our last issue came on Saturday and although the weather was somewhat inclement, and consequently the ladies were not present, yet as regards the primary object of the gathering it was a decided success. At an early hour about one hundred of the Royal Engineers accompanied by their band marched to the field of battle. But it is due to them to state that they had the field almost entirely to themselves for some time, as but few citizens made their appearance for several hours. Owing to pressing business matters, we did not get to the ground till near two o'clock and upon entering the scene that met our gaze was the most animated and pleasing one we have looked upon in this country. To see one hundred Royal Engineers including their officers, with nearly as many civilians ‘as busy as bees’, some cutting down trees, some grubbing out stumps, and others piling wood upon several enormous fires, kindled for the purpose of consuming the timber. It was pleasing indeed to witness the happy reunion of the military and the citizens; but especially to see the officers for the time laying aside all distinction, and heartily uniting with the men in the arduous but praiseworthy employment of clearing the cricket ground. Shortly after two o’clock, His Excellency accompanied by Colonel Moody came upon the ground, and while the former was making himself agreeable to the people, the latter was making himself useful by taking hold, like a good fellow, and working amongst these men. Wile we would not overlook the fact that many of our citizens acquitted themselves nobly from the clergy to the day laborer, yet we must confess that our military friends carried off the palm from the point of numbers, time and execution. And when at 5 o'clock the victorious army retired to Camp, the field was literally covered with the slain. During the afternoon a subscription list on behalf of the Cricket Ground was circulated and being headed by His Excellency Governor Douglas with $50, soon reached the very handsome amount of $650. In the evening Captain Bulen of the steamer "Hope" kindly made it known that he would carry down from the Camp all those who wished to go to the city to finish the day by a dance. Accordingly that steamer brought down a perfect crowd of men, women and children, who adjourned to Mr. Hick's new Hall and enjoyed themselves till 10 o'clock, when Captain Bullen again placed his steamer at their service and took them to the Camp. Thus closed the labors and amusements of a pleasant and exciting day. And while the handsome conduct of Captain Bullen deserves more than a passing notice, we would express a hope that we may have the pleasure of witnessing many a happy reunion and many a friendly contest upon our Cricket Ground. We trust it will be pushed through to completion so as to be in good order by the birthday of our Gracious Queen - God bless her! 28th May - ... At 11 o'clock the sport commenced on the Cricket ground, and was kept up with considerable interest until 5 1/2 p.m. The contest was between 11 Royal Engineers and 11 citizens. The game was a very close one and elicited much good playing on both sides, and towards the close excitement ran height as the issue appeared somewhat doubtful; but finally the superior playing of the Royal Engineers turned the scale in their favour, they winning by 2 runs and 2 wickets to go down. At the announcement of this result three hearty cheers were given for the victors, and as heartily returned. 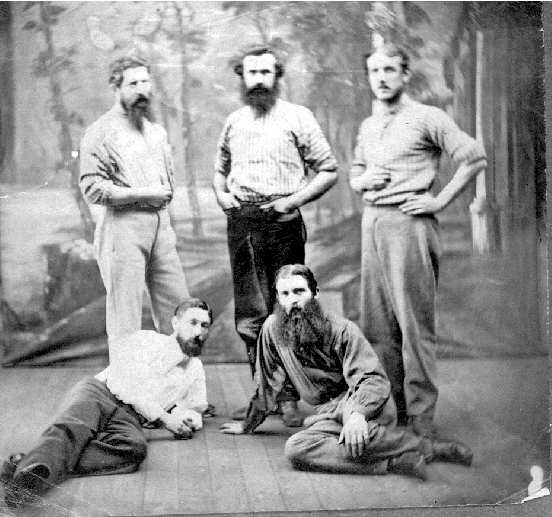 We think this photograph was taken *just* after the above mentioned match by Francis Claudet. Pooley, st. Osmet..............8 - Pooley scored eight runs before he went out. He was 'stumped', meaning he moved ahead to hit a ball, but missed it. The wicketkeeper, Sgt. Davey Osment, then caught the ball and broke the wicket (knocked one of those little bails off the top) before Pooley could get back behind his crease. Knipe, lbw, Haynes.............30 - Knipe is the hero of the day, scoring 30 runs before going out. He was finally trapped lbw or 'leg before wicket', meaning the ball was headed for the wicket but he blocked it with his body; you can't do that, and the umpire called him out. Bandmaster Haynes was the bowler who threw this marvellous pitch. Smith, run out.................1 - Smith was caught running between the wickets. He hit the ball and started running, but before he could get safely to the opposite crease a fielder threw the ball back in and broke the wicket. Sheepshanks, b. Edwards.........2 - My favourite clergyman, Sheepshanks, was 'bowled' by Edwards. That is, Edwards threw the ball right by him and hit the wicket, thereby striking him out. Pritchard, not out.....15 - All eleven players get to bat in an innings. However, two must always be up at the same time, so you only have to get ten out to end the innings. There is always one batsman who is left 'not out', and here it is Pritchard. - Well done, Claudet. A respectable total! Cole, b. Haynes....0 - Going out without scoring a single run in known as a 'duck', and results today in the other players making derisory quacking noises at you. Unless you are an officer, of course. roll away into the outfield. The batsmen can then run, just as if the ball had been hit. Wides....17 - These are pitches which are so wide of the mark the umpire says they don't count (like about 75% of the ones we bowl!). The batting team is given a free run, and the ball must be re-bowled. Leg byes...1 - Same as byes, except they bounced off the batsman before rolling away (which would be 'out lbw', except that in the umpire's opinion the ball was not clearly headed toward hitting the wicket). Engineers below his name coming up as his partners and going out one after another. against this bowler Bacon, who clearly is hell on wheels. This return match between the New Westminster Pioneer Cricket Club and the Royal Engineers' Cricket Club came off yesterday. On account of the unfavorable weather it was agreed to decide the game with one innings, the result of which was that the R.E. Club was beaten by 28 runs. - Two innings are usually played, but this being British Columbia it rained. - Note that by modern standards these scores are laughably low. Fewer runs were scored in the 1860's because of bad ground (harder to get the ball to roll fast or far) and a slow bowling style which made big home-run-style drives more difficult.